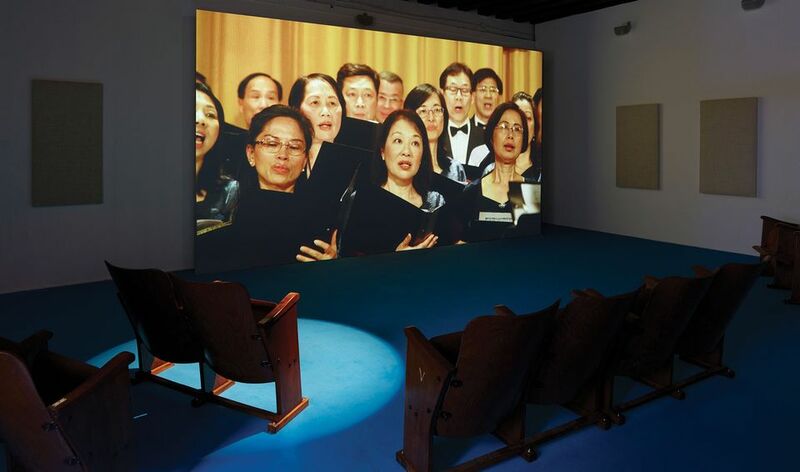 A chance piece of fake news was the unlikely trigger for Songs for Disaster Relief, Samson Young’s immersive, musical exhibition at the M+ Pavilion. The Hong Kong-based artist and composer discovered the story of Boomtown Gundane, an African musician who released a charity single in response to Band Aid’s Do They Know It’s Christmas? Called Yes, We Do, which aimed to “fund instruction in discipline, literacy and contraception” in UK schools. Only later, after trying to contact him, did Young learn that Gundane was a fiction. “The description came from a satirical news site and had made the rounds of the internet by the time I read about it,” the artist says. But the fantasy “almost made the story better”, he says, since “it gave me an incredible amount of freedom to build a world”. The feeling of unease and ambiguity runs throughout the exhibition. A new addition for the Hong Kong iteration is a self-playing piano, muted by personal objects inserted between the strings and hammers. A local audience may recognise the tune of Gather All Our Lights, a 1990 propaganda song broadcast by Hong Kong public television to cheer the people in the wake of the Tiananmen Square massacre. Performed by an array of Cantopop stars, it had all the hallmarks of a charity single. There is also a nod to political tensions between Hong Kong and mainland China in a video performance of We Are the World, the 1985 song written by Michael Jackson and Lionel Richie and recorded by the supergroup United Support of Artists (USA) for Africa. At Young’s invitation, the Kwan Sing Choir of the pro-Beijing Hong Kong Federation of Trade Unions, gave an energetically whispered rendition of the chorus. Young describes the muted technique as the “conscious suppression of dominant voices, as a way to uncover the unheard and the marginalised”. The choir is due to reprise the performance live at the Hong Kong Convention and Exhibition Centre on 28 and 31 March.